Michelle and Joel’s Dade City wedding featured a color palette of purple, blush and gold to complement their whimsical, and romantic wedding. The Sarasota couple decided to change things up from the typical sandy beach setting and opted for a Tampa Bay wedding venue that offered privacy, with a homey feel. Tampa Bay wedding florist Northside Florist used their creativity to come up with an array of unique centerpieces and elegant bouquets that would pop against the dark purple bridesmaids dresses. 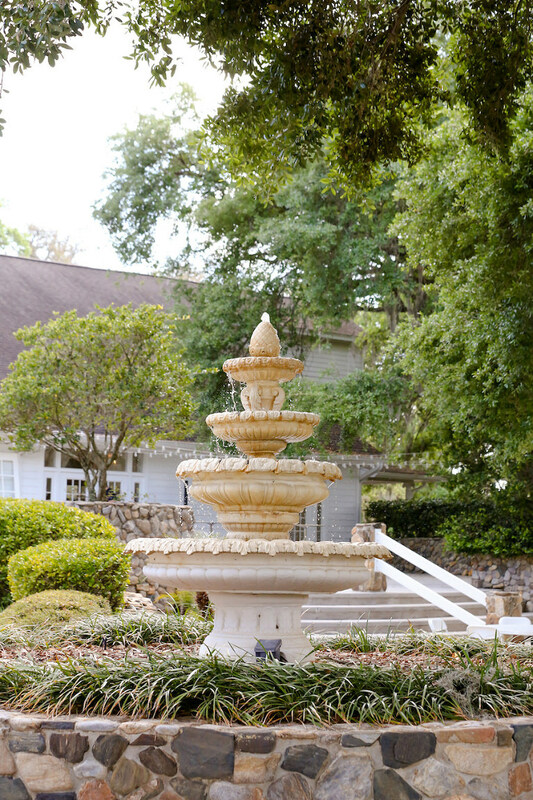 Knowing that food can often make or break a wedding, the couple hired reputable Tampa Bay wedding caterer Olympia Catering. “We chose to have a dessert table because some people may not like cake, but may like pie. Plus, we had kids of all ages who may like cookies instead. We chose a wide variety of desserts so that people would have more options, and they loved it because everything was gone by the end of the night. A Piece of Cake had the most variety of desserts, and if I came up with something that wasn’t on the list, the owner, Laurie, had no problem creating it. Their service and desserts far exceeded my expectations, and they set it up so beautifully on the table, I almost didn’t want to touch it. 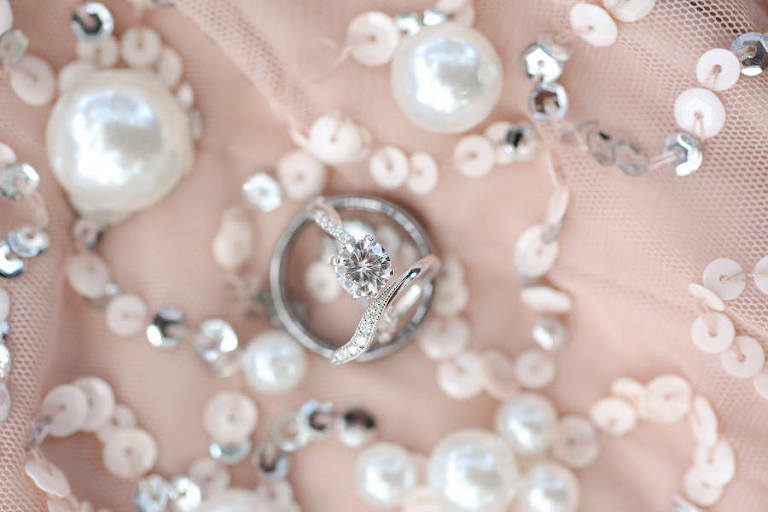 Looking back, the couple’s most cherished memories were preparing for their big day. “Our most memorable moments were getting ready with my bridesmaids and Joel with his groomsmen. For Joel, a couple memorable moments were me giving him a locket with his mom’s picture for him to keep in his jacket for the wedding, our vows and his sister and brother giving a toast to us. For me, our vows were one of the most memorable moments of my life and our first dance; it felt like we were the only ones in the room,” the bride reminisced. What was your floral inspiration? My floral inspiration was romantic with pops of deeper purple. I looked for an affordable wedding florist with creativity. Kathy at Northside Florist was creative, and her designs in the studio were beautiful, so I had no worry about what we would find on our wedding day. I was able to add even more items and flowers and still be in my budget. The Northside Florist team were amazing! I cried when I saw my bouquet with the bridesmaids bouquets because they were everything I wanted and more. We both wanted privacy and no beach. We loved the big oak tree at The Lange Farm; it made it feel more like home and that we could rent out the whole farm for more privacy. 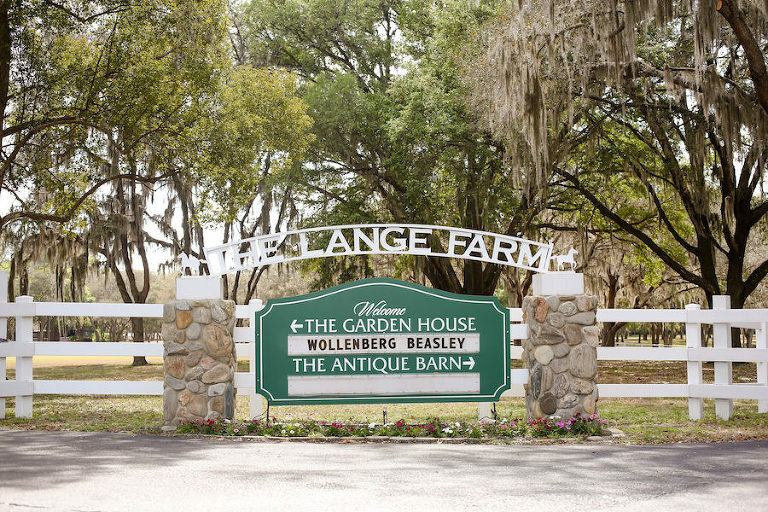 The Lange Farm’s services far exceeded my expectations; can we get married again?! Christmas morning Joel came over told me I had to open up my Christmas presents outside because they were active. So we drove over to one of the locations where we had our first date in Sarasota, the Celery Fields, which is a hill. We walked around and at a certain spot, where we were overlooking lakes, he gave me my gifts. Then we stood up there looking out and being Joel, loving to tease me, he said wouldn’t this be the perfect moment to propose. I’m like yeah it would have been. He said all he would have to do is pull out a box at the same time pulling out a box. He said the sweetest things to me and asked me to marry him. It was perfect. Whimsical and romantic. I didn’t really choose this theme, it just happened to come about with everything that I loved and was picking out for the wedding. 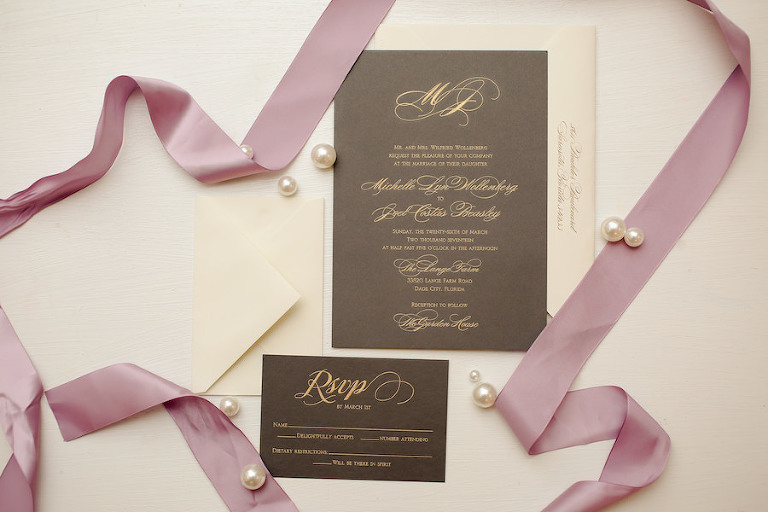 Darker purple, blush and gold to make it more spring rather than dark. We both love purple! I added some white on the sweetheart table to make it pop and the centerpieces on the tables had black lanterns to offset the other gold centerpieces. What did you look for in a wedding DJ? I wanted a DJ who was fun, but professional, knew how to get a party started and who worked great with my day of coordinator. I was told by a few people to hire Cory from Grant Hemond & Associates and that I would not regret it. They were more than right! He had everything we were looking for, plus he was our age, so we just all hit it off great! I recommend Cory to everyone now! What was your dessert inspiration? We chose to have a dessert table because some people may not like cake, but may like pie. Plus, we had kids of all ages who may like cookies instead. We chose a wide variety of desserts so that people would have more options, and they loved it because everything was gone by the end of the night. A Piece of Cake had the most variety of desserts, and if I came up with something that wasn’t on the list, the owner, Laurie, had no problem creating it. Their service and desserts far exceeded my expectations, and they set it up so beautifully on the table, I almost didn’t want to touch it. What did you look for in a wedding caterer? Your guests will always remember the food you had at your wedding and how good or bad it was. We wanted amazing taste, but at a decent cost. It also helped a lot since we weren’t from Tampa to have a caterer who also includes the cake so we didn’t have to go too many places. Olympia Catering’s food is absolutely amazing, and Sherri was so wonderful to work with! She went above and beyond to help us get what we want within a decent budget. If someone is not in your budget, ask what you can do to stay within the budget or find someone who may not have 200 reviews as they may be cheaper, but still just as exquisite. This is your wedding day, find vendors who you feel completely comfortable with.